On Saturday the show's Chris Redd played a rambling West as Alec Baldwin reprised his role as Trump, who called the rapper "the black me." 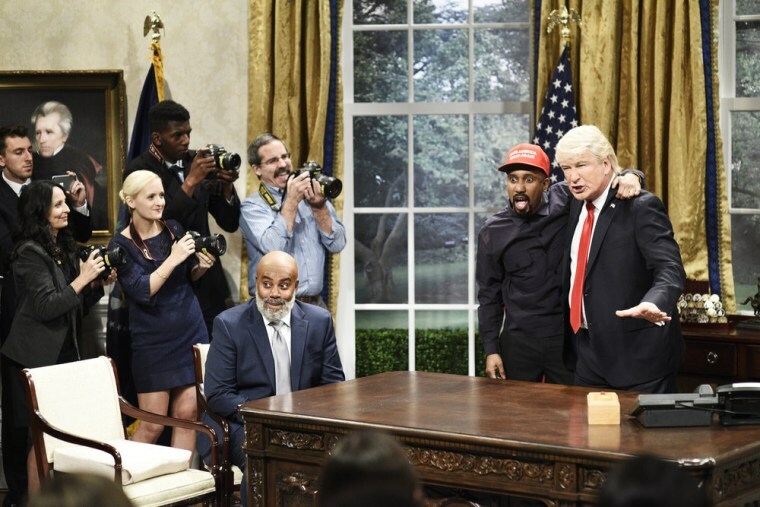 "Saturday Night Live" opened the third show of the season with a jaded look at Kanye West's bizarre visit this week to the White House. During the real meeting with President Donald Trump on Thursday, the hip-hop star made odd remarks, including, "Let’s stop worrying about the future, all we really have is today." On Saturday, the show's Chris Redd played a rambling West as Alec Baldwin reprised his guest role as Trump for the first time during the 44th season of the live comedy show. Much of the humor took place inside Trump's head as he realized the rapper wasn't entirely coherent. "I flew here using the power of this hat," said West, who was wearing a red "Make America Great Again" cap. Trump's inner voice said, "I’ve been in a room with Dennis Rodman and Kim Jong Un and they made a lot more sense than him." After West said he was a "stable genius" with a high IQ, Trump said, "Oh my god, he's the black me!" Later, Trump said to West, "Maybe we should order your lunch from a pharmacy." Bill Cosby, sentenced last month in Pennsylvania to three to 10 years for sexual assault, made an appearance in prison. Played by Kenan Thompson, Cosby noted that Jell-O is a staple behind bars. Nonetheless, he told a new cellmate, "I'm busting out. I got Woody Allen to drive the getaway car. Between the two of us we got one working eyeball." On the show's "Weekend Update" news segment, co-host Colin Jost returned to West's White House visit, saying, "It’s not the end of the world, this is the end of the world." He was referring to a report this week from the United Nations' Intergovernmental Panel on Climate Change that predicts food shortages, more wildfires and other calamities by 2040 if global governments don't act to further reduce carbon emissions. "Why don't I care about this," co-host Michael Che said. Seth Meyers, who hosts NBC's "Late Night with Seth Meyers," was the show's guest star. He returned to helm a skit, "REALLY!?!" that he used to perform when he co-hosted "Weekend Update" with Amy Poehler. This time the topic was West's meeting with Trump. "The only place those two should meet is in group," Meyers said. Michael Che said he negotiated a contract with "SNL" that allows him to use the n-word four times this season. "I just want to know how much money does this n----- owe in taxes," he said of West. Myers said that when Trump and West hugged, "You can see black people and white supremacists betrayed in the exact same moment." Jost said Meyers who with former President Barack Obama roasted Trump at the 2011 White House Correspondents' Dinner, "is to blame for making fun of Trump so much that he decided to become president."